An interview with Benedict Cumberbatch, who plays Sherlock Holmes in BBC One's Sherlock. The legendary detective Sherlock Holmes is back with a brand new adventure. We sent Blair Herter to interrogate Robert Downey, Jr. on his latest film. 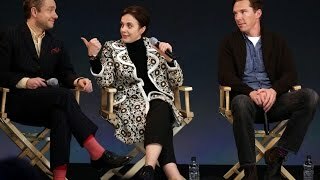 Series 1-3 Blu-ray - Actors Benedict Cumberbatch, Martin Freeman and Amanda Abbington, writer Steven Moffat and producer Sue Vertue discuss Sherlock. MSN Movies chats to Sherlock Holmes director Guy Richie and cast members Robert Downey Jr., Jude Law and Stephen Fry. Andrew Scott - Interview at the Late Late Show 17-01-2014 Просмотров: 249938 No copyright infringement intended. WHOLOCK - Sherlock meets The Doctor!